Gun safes are a secure, protective container for you to store your firearms, ammunition, and gun accessories. Owning a gun definitely has its perks. It gives you an added sense of security. However, if you’re not a responsible gun owner, accidents can happen. And when it comes to guns, accidents can mean life or death (Source). That’s why being the responsible gun owner that you are, you might find yourself looking for a decent gun safe. But choosing a gun safe can be difficult. You need something that has a high temperature resistance but at the same time doesn’t cost a fortune. A good gun safe should be secure, spacious, and durable. The best safes are made from thick steel plates that provide drill and fire resistance. Theft alarm and override key features are optional but they can provide added security. You want a gun safe that’s “SEA”; safe, efficient, and affordable. Where do you find these qualities? Well, let’s take a look at the best five gun safes on the market and what makes them special. If you’re someone who knows their guns, then you’ve probably heard of The Winchester Company. It’s quite reputable, dating all the way back to 1866. The company’s known for producing all kinds of equipment, from scopes and firearms, to some of the best gun safes on the market. 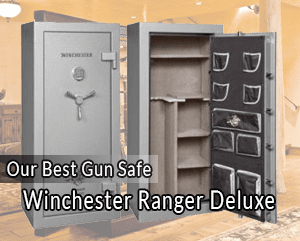 The Winchester Ranger Deluxe is an all-around great gun safe that comes at an even better price. Couple that with impressive features and elite quality, and you’ve got one hell of a safe. The Winchester Ranger Deluxe is a heavy duty safe weighing about 560 pounds. On the inside, you’ll find a surplus of 12 pockets for storing as many firearms and accessories as you’d like. It also comes with an accessory door panel, modifiable shelves, and auxiliary shelf covers. Rest assured, with The Winchester Ranger Deluxe, no one will have access to your guns but you. Intruders don’t stand a chance. Good luck breaking into its nine 1.25- inch locking bolts. In case of fires, the Ranger Deluxe comes prepared with a 12 gauge steel plate of one-inch thickness. It can withstand the onslaught of 1400 degrees Fahrenheit for up to an hour. Even more impressive is that the Ranger Deluxe comes with advanced lock protection features that are only found on more expensive models. It’s actually the cheapest model manufactured by Winchester, yet it comes with all the best features. The Mesa Safe company isn’t quite as old as The Winchester. That being said, they’ve spent the last 40 years producing some of the best quality all-steel safes on the market. The Mesa Company favors an all-steel, impenetrable build. This safe in particular is a burglary and fire safe which means it’s designed to withstand fires and thefts. Its fire-resistance actually rivals that of other, more expensive safes on the market. Mesa is known for its unique locking systems which have been designed with a former locksmith’s expertise. Couple that with extremely sturdy hinges and a solid steel plate, and you’ve got a fortress to keep your guns safe. You’ll also find a powerful mechanical dial lock covered with a thick, drill-resistant plate. Right beside the plate you’ll see some impressive 1″ live locking bolts. There’s practically no room for a forced entry. In terms of fire resistance, this Mesa can withstand an onslaught of two hours at up to 1830 degrees Fahrenheit. Most gun safes can only hold their ground for an hour or so. Luckily, the Mesa isn’t like most gun safes. It’s on a whole different level. Relatively expensive, yet still under 1500. The Steelwater Company makes some of the best multi-feature gun safes you’ll ever find, all at a reasonable price. Steelwater’s founder has 5 years’ experience in law enforcement. He’s also well-versed in the locksmith trade. All the servicing, repairing, and opening of gun safes. The whole deal. All of this knowledge has gone into protecting your guns. The Steelwater truly is a heavy duty safe. Rugged, solid, and durable. It’s made from the highest-quality material of 12 gauge steel, making this gun safe virtually unbreakable. On the inside, you have adjustable and removable shelves that can house around 14-18 long guns comfortably. For added space, you can remove the shelves to accommodate up to 22 long guns. This is another fire-resistant safe, although not as fire-proof as the Mesa. The Steelwater can stay strong for up to 60 minutes under a fire of 1875 degrees Fahrenheit. The gun safe’s door is drill-resistant, along with a gear driven lock and bolt system. In other words, the Steelwater can’t be drilled or pried open. Neither fire nor mechanical methods of forced entry will work on this gun safe. The Steelwater is actually one of few safes whose qualities surpass the regulatory standards of California D.O.J’s residential safes. Take about secure! Normally doesn’t include a digital combination lock, although some newer, improved models have one. Here’s a safe that is California D.O.J approved for safety. You can sleep peacefully at night knowing that the Stack-On Armorguard will protect your guns from fire, theft, and trespassers. The Stack-On is quite a beauty with its black finish paint and a thin silver lining to go with it. As classy as the door is, it’s not just for show. It’s actually filled with fire retardant material for added protection against fires. The interior is just as impressive housing a few carpeted barrel rests, along with pouches attached to a door organizer. It’s divided into several compartments, 2 for guns, and a few others for accessories and ammo. The Stack-On’s features don’t stop there. It comes equipped with backlit, automatic lock, and powerless keypad number visibility. You’ll be able to get to your guns even if the electricity’s out. Like the last two safes, the Stack-On is also fire-resistant, although considerably less. It can take a fire of about 1400 degrees Fahrenheit for up to 30 minutes. Not the best resistance on this list, but it can still take a punch. In addition to fire-resistant material, you’ll find an impressive 4-way locking system, along with 1.5″ live locking bolts. Good luck forcing that open. Perhaps even more impressive than the physical features, is the Stack-On’s entry error feature. If someone tries to guess your passcode and fails 3 times, the safe automatically times out. The Sports Afield SA5520 is the loudest safe of the five. If anyone tries to force their way into the gun safe, it’ll immediately set off a theft alert audio alarm. The Sports Afield is strong, rugged, and durable, thanks to its 14 gauge steel walls. On the inside, there’s the standard adjustable shelves and door organization. It also has USB ports and a removable external power cord. The Sports Afield is somewhat average in terms of fire resistance. At 1200 degrees Fahrenheit, it can last for about 40 minutes. It does however, incorporate an expandable Palusol fire and smoke seal for added safety. The 6 large 1.25″ steel bolts, along with the 14 gauge steel walls, make a thief’s life infinitely harder. Not to mention there’s a programmable, illuminated electronic lock that comes with an override key. And let’s not forget the best part about the Sports Afield: the loud theft alert audio alarm. 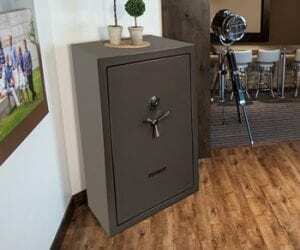 Now that you’ve seen some of the best gun safes on the market, you probably want to know why they’re considered the best. What makes them so special? What should you look for in a good gun safe? Here’s the deal. When it comes to gun safes, some people make a beeline for the strongest, most durable safes on the market. Unfortunately, the interior’s usually quite cramped. Others prefer a spacious interior over durability. But why not both? Let’s start with the first factor: capacity. If you’ve ever been camping, you know that a 4-man tent barely fits two. Same with gun safes. Their advertised capacity is one thing, and their actual capacity is a whole other thing. That’s why you have to think ahead. Let’s say you’re buying a safe to store 8 guns. Then you should buy a 16-gun safe, not an eight. Why? Simply because the advertised capacity is often referenced to average-sized guns. Yours might be larger and therefore, might take up more space. Also, the mentioned capacity usually works only if you store the guns exactly like they recommend. And let’s not forget that sporting rifles take up much more space, thanks to their pistol grips and accessories. Add a few scopes and you’ll find your 10-gun safe barely fits 5. Even if they do fit perfectly, you’ll find yourself taking all the guns out every time you need one. Point is: always think bigger when it comes to capacity. Dimensions matter. Especially if you’re building a place for your safe from scratch or if space is a bit tight. Bear in mind that advertised dimensions can often vary by an inch or two from reality. This is often done intentionally because companies adjust their dimensions to match competitors’. Don’t fall for it. Buy the safe first, and then design the space. Or even better, measure the gun safe at the showroom. Security is obviously an extremely important factor to consider. After all, you need to be sure your gun safe will literally keep your “guns safe”. Here are a few factors that determine how secure a safe is. Fire resistance is one of the main factors that people look for in a gun safe. Some safes can last for 30 minutes, an hour, or even more under various degrees of fire. But what does that mean? Let’s say a gun safe can withstand 1800° F for up to 60 minutes. That means that the interior will also remain below 350° F for 60 minutes. Is that good enough? Definitely. Bear in mind that paper chars at around 405° F and guns begin to take damage at around 500° F. In other words, the contents of your safe will be secure, as long as the inside remains around 350° F or below. Generally speaking, if you want a fire-resistant safe, then look for something with at least 1 hour fire rating. Anything lower might not be your best choice. Don’t be fooled by numbers. Some people think that a 14 gauge safe is thicker or stronger than a 12 gauge. Wrong. It’s actually the opposite. Put in the simplest way possible, the smaller the gauge number, the thicker the steel plate. That’s because thickness is expressed in fractions. A 12 gauge gun safe isn’t 12 inches thick. That’s not possible. It’s actually 1/12 inches thick. Likewise, a 14 gauge gun safe is 1/14 inches thick. Remember 4th grade fractions? 1/12 is definitely bigger than 1/14. So remember the golden rule: smaller gauge, more thickness, better protection. When it comes to choosing your gun safe, you sure have a lot to consider. But the most important thing is to have a clear picture of what you need in mind. Decide whether you prefer durability or capacity, build or size, and so on. Once you’ve decided, finding the right safe won’t take much time. Even better, why look for one when you can choose from 5 of the best models available on the market? And of course, the best part is that they’re all affordable and under $1500.